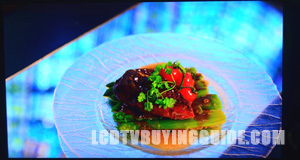 The Sony KDL-55W800B is a feature packed mid level LED TV for 2014. The X-Reality PRO processing engine and the 120Hz native refresh rate are the star features here. You get top quality images associated with the Sony brand as well as great refresh rates for live sports programming, gaming, and fast action. Sony went with active 3D technology on this one. We've really been loving passive 3D lately so it's a shame to go back to active here. The 50-inch size starts at a reasonable $1,299. This model gets the excellent processing engine, dubbed the X-reality PRO by Sony. The similar W802A from last year had the same image processor under the hood and we are happy to see it here. This really pushes top tier picture quality on the display in terms of detail, clarity, upconversion, and color reproduction. Color performance on this TV is very accurate and realistic with good saturation levels. Only the 4K TVs in the lineup have a stronger image processing engine. 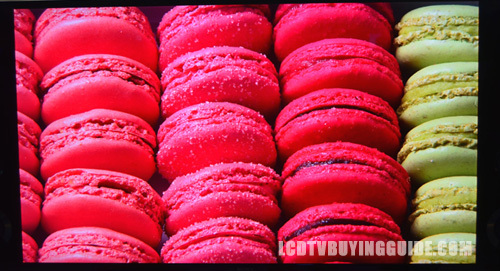 Once calibrations are made the picture quality on the 55W800B is very good from both HD and standard definition sources, though not as strong as those top units with a clear coat screen or top 4K TVs. The light-flow through the screen is not quite as pronounced. However, accuracy is not a problem for the TV. Side viewing angles contrast and saturation degrade pretty quickly at 20 to 25 degrees off center and get worse the further to the side one goes. This is the case with all matte-screen LCD TVs that we have tested. Front and center, you will see a very good colorful and accurate picture, but from the sides you will be disappointed. Light output is good, as are black levels and shadow detail. Sony has gone back to active 3D tech. 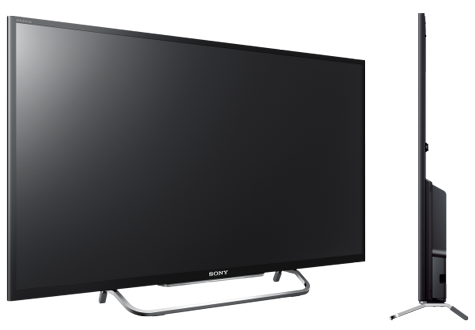 Sony TVs from last year saw a lot of passive 3D, and we thought they did an excellent job. The clear benefit of active 3D is full HD resolution going to each eye. You are going to get a more detailed picture thanks to that, and it looks great on the W800B. 2 pairs of 3D glasses are included in the box, but if you need more they are going to cost a pretty penny. We noted some crosstalk and flicker when watching in a brightly lit room. The 55W800B does a very nice job of converting and processing lower end signals to the native 1080p resolution. This is a strength of Sony in general and this TV in particular. 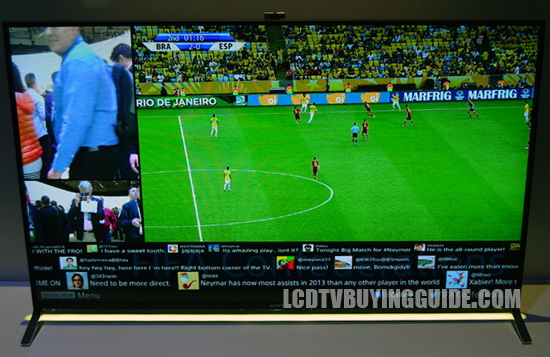 Since there is still plenty of lower end signals coming in (think streaming content), you still need a TV that will up-convert well and not overlook this important area. The new layout of the Sony Entertainment Network contains category separations for Movies, Apps, Music, and Albums. It's a very attractive and easy to use layout. The biggest plus is that it operates much better than 2013's SEN. The Apps selections are more interesting than in the past as well and we see lots of improvement from Sony in this area. But perhaps the best part about this feature from my perspective is to be able to Skype with a split screen and talk to someone about what you are watching. Keep in mind that your company on Skype will also need to have this functionality in their TV either a Sony with Split screen Skyping or something similar from another brand. The compatible camera for this feature is sold seperately. The KDL-55W800B features (2) 10 watt speakers that can achieve good levels of sound to fill medium sized rooms. They aren't going to pump out entertainment center quality, but they get the job done. There are plenty of presets to get the best out of the source material as well. We really liked having those options. Bass seems to be the biggest problem with these on-board speakers, but that is understandable. We reccomend a sound bar or home theater setup for those looking to get the best sound for their movies and sports programming. The W800B has a similar appearance to the W600B series below it. The main difference is the depth of the screen. The W800B is much thinner in profile. However, the part of the cabinet that houses the speakers still protrudes out. So it isn't a completely super thin TV. Take that into account when you are deciding on where this TV is going to go in the house. The thin black bezels and chrome wire stand are very minimal and don't take attention away from the screen. The KDL-55W800B aims to be a strong value in the mid tier realm for Sony in 2014. Some of the best picture quality features are packed into it without any extras driving up the cost. On board sound quality is probably the only thing that doesn't fare so well, but that can be easily fixed. The Samsung UN55H6400 stands as direct competition. 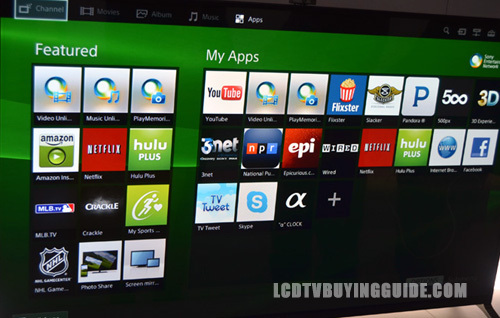 It sells for more, but offers an excellent Smart TV platform with a Smart Touch remote to sweeten the deal.